We pretty much shut down for the holidays if you couldn't tell, and hopefully we didn't loose what little viewership we already had but in any case I thought I'd get the ball rolling with some old news! I know I cover a lot of Fate/Stay Night on this blog (and Hatsune Miku), but this little nugget is too good to pass up. Unless you were looking for it it kind of got buried with the slew of Comiket announcements (namely all the Max Factory new releases for next year. 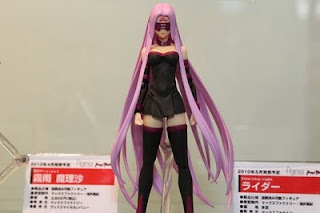 The news: Rider from Fate/Stay Night! Rider has always been one of my favorite characters in F/SN. When I was in Japan she was the only character I used when I played Fate/Unlimited Codes at the arcades, so I couldn't be happier. I think I recall complaining on this very blog about how there were a severe lack of villain characters with the F/SN Figma releases and this finally remedies that. Now I can finally have my F/SN Figma's fighting someone. I didn't see a release date mentioned on any other sites, but judging from the little placard next to her it looks like a May 2010 release, which is a LONG ways off, but better late then never. Also I hope she comes with at LEAST four faces. Two with blindfold and two without.